“But I don’t play tennis”- a comment heard in sports medicine offices around the world when talking about the most common cause of elbow pain – Tennis Elbow. Lateral epicondylitis is the term that describes pain at the lateral aspect of the elbow or the part that faces forward when standing like a soldier. 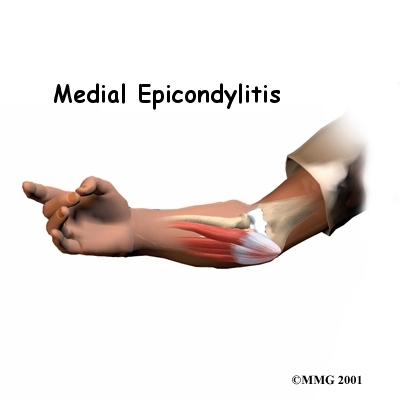 Medial epicondylitis is on the inner side of the elbow the part that rests against the body when standing straight. It can be the bane of the patient’s existence especially if they have dealt with it for months and months. Unable to lift a coffee cup, pull a gallon of milk or water out of the fridge, open a jar of almond butter? You can see how quickly annoying this diagnosis can become. The problem is it is not usually a sudden rip tear or pop that leads to it. It is usually insidious, peeking its head out every now and then, not really affecting daily life or workouts. You might then see it recur every time you go to grip heavily. In the CrossFit world, we are talking about anything that requires a grip—lots of things. Pull-ups, deadlifts, heavy farmer carries, kettle bell swings, dumbbell squat snatches, rowing, etc. Gradually, the pain might then infiltrate daily activities and then you say “Whoa something is not right. But I didn’t do anything.” So, insidious and slow can be just as bad as a sudden rip or tear. If you look at my original post in 321GoMD about tendonitis, you can see the tendon fibers that start to get little microtears in them that then need a chance to heal except they never got the chance. What this reiterates is please please please listen to your body. Do not ignore the subtle changes that can occur with exercise. Tendonitis always wins. If you don’t listen, things can get so bad that it leads to- not tendonitis but tendonosis. This is where the tendon degenerates and loses the inflammatory or healing changes. It then goes on to be replaced by scar tissue which as we all know is not healthy normal tissue. 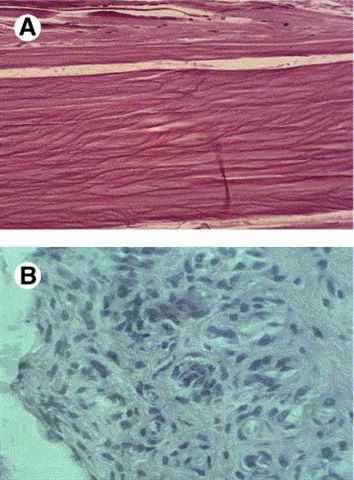 Dr. Nirschl promoted the concept based on the histology seen in the tendon at the time of surgery and coined the term angiofibroblastic hyperplasia as seen here with normal tendon followed by pathologic tendon. Anatomically the extensor tendons are the tendons that start at the lateral epicondyle, muscle bellies run down the forearm and they end in tendon attachments to the wrist bones and finger bones. These tendons straighten or extend the wrist and fingers. 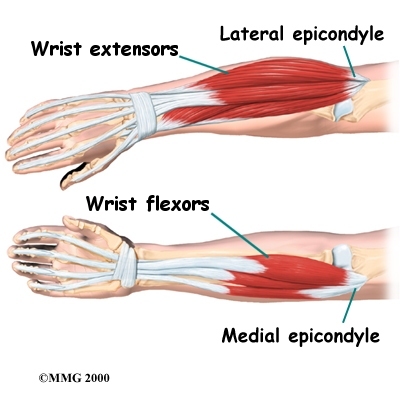 The flexor tendons start at the medial epicondyle run down the forearm and attach to the wrist and fingers to flex them or curl them down. Treatment is aimed at alleviating symptoms and decreasing stress across the elbow joint. There are a multitude of treatment options starting from conservative to aggressive. I make recommendations for patients based on what they have tried, how severe the symptoms are, and how much interference the condition has with normal, work, and fitness activities. When it does not get better we can start with PT, tennis elbow strap, stretches, strengthening, massage, chiropractic treatments, ART, iontophoresis, cortisone injections, PRP injections, surgery. If one of these options worked best and was the end all be all, there would not be a list of options. Some of these work quicker than others, but I will never recommend surgery on someone who has only had it for 2-3 months. Cortisone has its side effects and PRP has been shown in some studies to have promising results and others not as good. PRP is platelet rich plasma injection where one draws a small vial of blood and spins it down to get concentrated growth factors in the plasma that are then injected into the area to try to stimulate healing. Surgery is undertaken when things are not going well and the pain and dysfunction is inhibiting normal life. In picture below of a right elbow with fingers to the right of the picture, the ECRB is the tendon which is responsible for the pain that occurs. Here is a test hold your wrist out straight and then try to push down on the back of your wrist with your other hand. The ECRB is firing when that occurs. After release of the tissue it can take about 3 months to get back into the swing of things with heavy lifting sometimes even longer. Initially you can move your elbow but have to protect it for 6 weeks then gradual strengthening takes place. The condition on the medial side is similar it just hurts with wrist flexion, but the treatments and the surgery are similar. So remember, listen to your elbows and don’t let your tennis elbow knock you out of the game, set or match. I have a bulging disc in my nesk and dealing with a huge knot that cause so much discomfort in my back next to my right shoulder and neck area. The area stays tight all the time. Now I noticed flipping a basket of fries one day at work while back I jave pain in the right elbow when grasping objects. Even straightening it is challenging I notice the inside of my upper bicep will get numb and cold. Can this be caused from the disc itself and my shoulder previously an issue or is there no way the two can affect one another. Very messed up right side indeed. Locking fingers can be what is called a trigger finger and are usually not connected to tennis elbow. I am writing to you because I heard you on the Active Life podcast and was wondering if you would be willing to give me your opinion. For the past year, I have been having elbow pain when overhead squatting. My elbows naturally hyper-extend, but my right elbow more than my left. This causes my right elbow to bear most of the weight held over my head, and when I put the bar down, my elbow is stiff and sore on the inside (from the pics above I would describe it as the medial epicondyle area). Over the past year, the pain has gone from only appearing only after OHS to hurting in a front rack position as well, to also appearing when simply extending my arm out. I never have this discomfort in my left elbow. The discomfort in my right elbow is manageable so I do not scale movements often. However, I have found that the discomfort subsides temporarily after i do bicep curls (until i front rack a barbell again, and the soreness/pulling sensation comes back). Do you think this is something I should contact a doctor about, or is it normal to have some soreness/pulling in the elbow as a woman (because our elbows hyper-extend more than men?) I am not sure if you have heard this complaint before, and I know you cannot diagnose via a comment on a blog, but I do not want this to progress to something worse. Any advice you could provide me would be awesome! Yes I would see someone and no you shouldn’t have pain with pulling. Read above and tendonitis post that I wrote. Good luck with it. Yes would see someone about it for confirmation. Great podcast with CrossFit absolutely loved it and this site. I have found this site so informative. I have been battling with Medial Epicondylitis for about 10 months now, some days its not an issue and some days it is. I believe started when we had big farmer carry day and I switch position to desk job. I got a ergo keyboard and mouse to help with the desk job. It is really painful when I do thrusters or high volume (25+ cleans with 50%RM). My ortho thinks it is just inflammation that is pinching a nerve, I have taking 3 rounds of medical steroids in those 10 months to help it, I have not done MRI or PT for cost reason. I have done flossing twice a day which has seemed to be the most beneficial. My coach has mention is could be a mobility issue with my scapula. Any advice? Kathryn, you are asking for really specific personal information. I cannot give advice unless I examine you. I would be happy to see you in the office. Very Informative article. I was looking for some info on elbow pain and came through this article. I have pain in my elbow since Jan 2014. It started when i picked up heavy monitor up the stairs in my house. Since then i get pain even when i lift a cup or glass of water. Now since last few days i feel the pain on wrist extensors( using this term from pictures above 🙂 ). Even while closing and opening fist i feel as if my hands are really tired. When i extend my arm in front and close my fist i get pain on wrist extensors and elbow joint. I do my house work and work on PC for 6 – 7hrs. Now i find difficult to manage my house hold jobs with my right hand. Certainly you should see someone if you have pain for 1 year. The pain is lateral and some of the movements you describe can stress the extensors so it could be lateral epicondylitis still. A good exam should be the key. I have been working out for some time,but for past 1 year..I have been experiencing pain in my left elbow,.which is located at the spot of lateral epicondylitis . However,.I do not feel any pain while gripping heavy things or pulling movements(dead lifts or rowing movements). but the pain I feel is during the pushing movements;when my elbow gets extended, namely..bench press(chest)..push downs(triceps),and other shoulder exercises(front delt)s.
The pain is not there in daily tasks and it goes away if I stop working out for a few weeks..but again,.as soon as I hit the gym back n start going heavier..its back. I dont feel any pain in my right elbow. I got an X-ray done,.reports are fine though. Thanks for all your work on this site. Great info. I’ve been dealing with elbow pain when I do pull ups for about a month now and I couldn’t figure out what the heck was going on. This description fits my issue (medial). Can you recommend some stretching movements I can do to help? Should I stop working that part of my body for a while? I’ve been using the bands at the box to stretch, but i’m not sure if thats the right thing to do. Hi Pat the pain reduction can be painstakingly long for medial epicondylitis. timeline depends on how it feels and how long you have had it, certainly stretching and strengthening without pain is OK.
Ice can also be substituted in if it helps more than the heat, but like I said heat tends to be better for those chronic cases that aren’t healing with rest. Pat, I haven’t examined you but I would say Steve’s protocol is reasonable as long as there is no pain. Nice article, Dr. Rockett. Thank you for a real-world description – I felt like you were describing my elbow. After a year of struggling with almost every treatment for medial epicondylitis (osis, perhaps), I finally received a PRP injection 2 weeks ago. I have not noticed any significant reduction in pain, despite ceasing all activity with my right arm (save for light activities of daily living/grooming/hygiene). Should I expect the improvements in pain reduction to be this gradual? Is this common? Also, in your estimation, is there a safe timeline/standard where it would be advisable to beging low-intensity rehabilitation via stretching & stregthening? Thanks a million! Looking forward to wodding again soon!